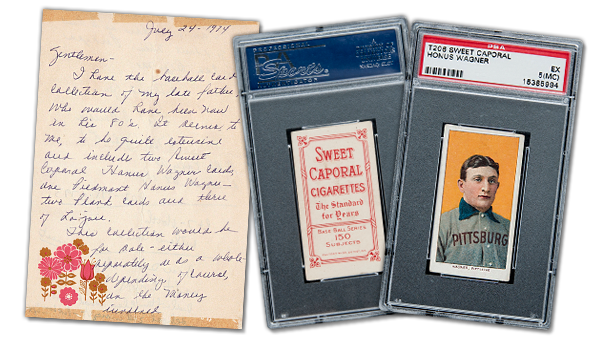 Goldin Auctions is responsible for the sale of the ONLY known PSA graded EX 5 (MC) 1909-1911 T206 Honus Wagner card the last two times it was sold, and both times shattered the existing records for the sale of any baseball card. In 2013, we sold the "Jumbo" Wagner at auction for $2.1 million. 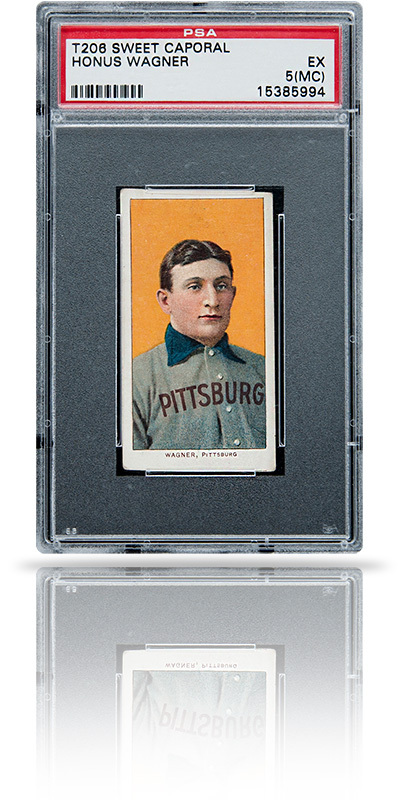 On October 1, 2016, the same Honus Wagner card sold for $3.12 million. We are honored to be trusted with this card, not once, but twice, and are proud to serve our sports collectibles consigners in a way that earns their confidence. What Makes the T206 Honus Wagner Card Special? These cards are scarce. It is estimated that fewer than 200 were printed and fewer than 50 have ever been graded. This Wagner card is graded EX 5 (MC) by PSA making it extremely rare! Honus Wagner specifically asked to no longer be featured on future printings of the cards, and that is why there are fewer of him than other players from the same set. Speculation says that he didn't want his image to be used for a tobacco company's marketing, but regardless of why, we're just glad he spoke up! And it doesn't hurt that the man is a legend. The shortstop, inducted into the National Baseball Hall of Fame in 1936, was a bit of a unicorn - a mythical creature, scarce at best, for being so amazingly well-rounded. He could play solidly in any position, adjust to any situation with amazing accuracy, and bucking the traditional rules of form and hand placement, Honus Wagner could hit with such skill that over 100 years later, he still remains one of the best hitters in the game. Yes, you read that correctly. There is an art to it. It would, understandably, be easy to assume that any sports collectible as special as a T206 "Jumbo" Honus Wagner card would sell itself, but as with any other industry, there are many moving parts that work together behind the scenes to present a seamless experience and product. Some are technical, such as working with the most trusted professional graders in the industry, like PSA, or managing the logistics of moving, protecting, and presenting small, delicate items of such value with immense care and planning. Some are a result of experience, years of networking, and a solid reputation. We have to be able to effectively market the items, like the Honus Wagner card, that are entrusted to our care. That might range from using our media connections for tv interviews to promoting and holding both live auctions and safe, secure online auctions on our own website. Reputation is built on a solid foundation of knowledge, experience, and the ability to get things done, and we're proud to count our Honus Wagner baseball card consigners among those who have trusted us to earn them truly great results.